Our mission to create a game in a week is on! We are attempting to develop and release a new mobile game in just seven days. You can read all about what we’re doing, and why on this blog post, or view all the development diaries here. 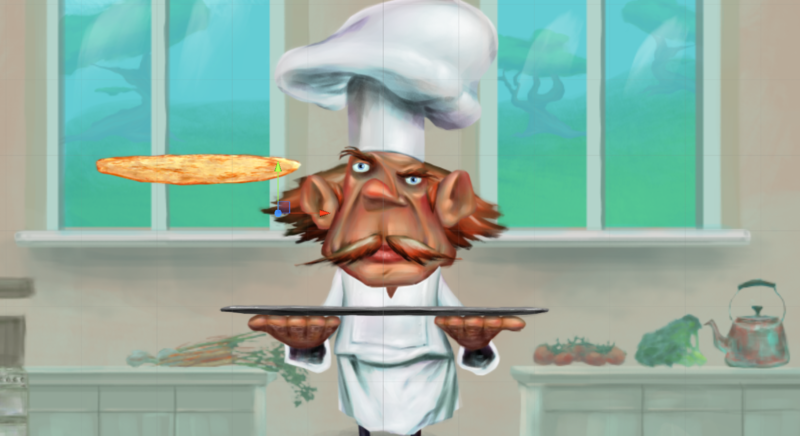 The final graphics for the chef and the pancakes are in, replacing the placeholder graphics from last week. After a weekend away from the game, today we hit the ground running! 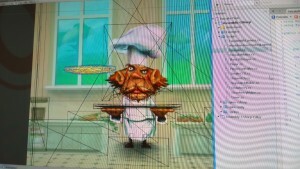 Alex has finished up the graphics now. He used a combination of Photoshop and Spine to create the assets for the game (which is the combination we are using for Bad Day for a Balloon Ride too), and I have spent the morning importing those and replacing my placeholder graphics. I’ve also been working on tweaking the physics to give the pancakes a more realistic feel to them, and modifying the friction of both the pancakes and the tray so they react realistically (so the pancakes don’t slide off the tray, but they would slide a little if pushed against a wall). I’ve also started work on the power-ups today. In the game, there are two different types. A strawberry which you can collect and it will bank your stack (so if you use a strawberry, and you have five pancakes in your stack, they get banked to your score so you can’t lose those five points), and a stopwatch which increases your remaining time. One fun side effect came about this morning when I was testing these power-ups. I had them in the game, but without the “collection” code working – so they were falling down and also being stacked just like the pancakes. Because of their shape, they were causing a slight explosion to the stack, sending them flying. Here’s a video showing that in action. …Which got me thinking that it could be fun to add in an object for the player to avoid, that would do just that. So that’s something we are going to add in at some point this week. So, as of right now the power-ups are in, the physics are basically done, and I’ve started working on the scoring mechanism.